Any planner addicts out there? With all of the variety to choose from, you almost feel like a kid walking into a candy shop! Which one to choose. Do I want a vertical or horizontal layout? Colorful or a blank canvas? Worksheets or no worksheets? The options are endless which is great because we all have different methods of staying organized but also overwhelming because...decisions. I originally discovered Heart of the Farm on Instagram. I was in a black hole of unproductive scrolling and happened upon someone’s post sharing this brand new planner that had just been released. Being a city girl and having avoided farms since I toured a goat farm in the Loire Valley, circa 2012, it doesn’t seem like the best fit but I’m here to tell you why this is a great planner for anyone, even those who don’t live on a farm. The Heart of the Farm Planner is an American-made brand of thoughtfully designed office products for the country at heart where faith, family and the countryside are at the center of it all. Based right in the heartland of America - Nebraska - Heart of the Farm was created and founded by Cory Ingram after an extensive, unsuccessful search to find products specifically designed for farm and ranch families. Whether you’re a farmer girl, farm wife, or a city girl with a part of your heart in the country, this planner is for you. So what is it about the Heart of the Farm planner I love so much? I recently did a deep clean of my desk and bookshelves and found a planner from 2012-13. At that time, I was working 2 part-time jobs, nannying a few days a week and attending a full schedule of college courses, Plus I was in a social sorority where I held a leadership position and maintained a pretty decent social life. The last few months, I kept trying to remember exactly how I juggled all of my responsibilities in college. I knew I slept, maybe not as much as I should have but I wasn’t an insomniac by any means. Flipping through this old planner, it all came back to me. Color-coded pens, deadlines written down, reminders for anything imaginable. I never let one thing pass me by and I have to admit, I was pretty damn successful. Remembering that feeling of productivity and stamina, it reignited a fire in me to get back on track and back to a place where I was on top of my life rather than my life running me over like a stampede of wild animals. As I flipped through Heart of the Farm, I realized it was exactly what I needed. The horizontal layout, the meal planning, the overall simple design. It has just enough to help stay on track without having too much become a distraction. The top 3 priority list for each day make it simple to create an actionable day while also leaving space for other reminders, notes and appointments. The monthly Dreams & Goals section give you a space to write down a few things you’d like to accomplish over the next few weeks so that if you ever need a reminder, you just have to flip to find that month’s tab. The Monthly Master Task List is mainly focused around the home with a few boxes for business. I haven’t figured out a use for this monthly page just yet but once the new year gets rolling and I begin to get back on top of everything I’ve lost track of, I have no doubt I’ll find a use for it. At the end of each month’s section are Weekly Menu sheets. Being the cook in my house and having to try several new recipes each week, this is incredibly helpful to plan each meal and write out the grocery list. For those of you who enjoy freezer meals, there’s also a page specifically for a freezer inventory so you can plan already made-ahead meals into your weekly plans. All the way in the back of the planner is a section for Field Meals. Since I don’t live on a farm and don’t plan to, it might seem silly to have this as a part of my planner. These sheets, however, have a dual purpose. Those of you who are dinner party hosts or have company often, these pages are fantastic tools for you. There are a few pages that include a Pre-Planning Checklist. This spreads tasks out over the course of a month so you’re not managing all of the preparation one day in advance. The same principal applies to feeding a dinner party as it does a field crew. Finally, there are 60 total meal planners. They consist of the main dish, side dish, dessert, recipe titles and locations with room for notes. If you’re serving a dinner party you need more than three dishes but those are the main ones to think about and the notes section leaves space for additional appetizers, cocktails and other things. Sure, the Heart of the Farm Planner seems to be intended for people who live on a farm or miss the farm but it’s design is multi-purpose. 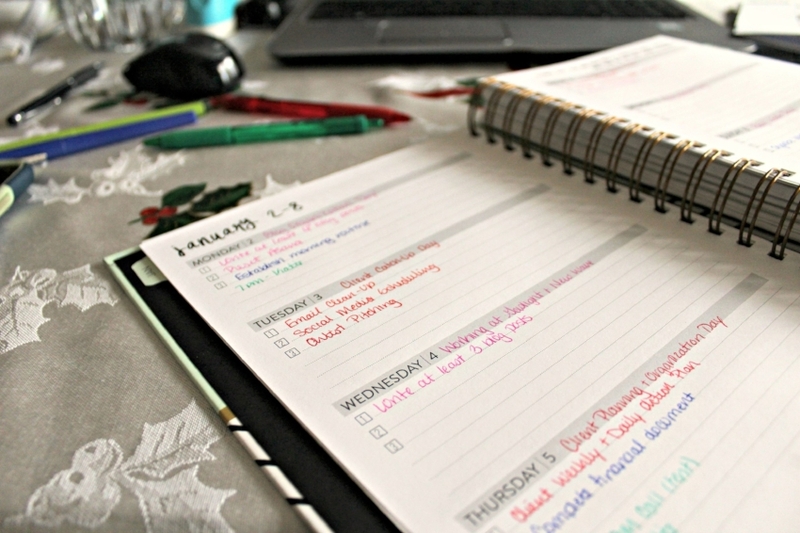 If a city girl like yours truly can find a use for every part of this planner, anyone can. Besides all of the working parts, it also has a clean design and is full of inspirational quotes to keep you motivated. It is a bit bulky so I recommend leaving it at the desk. There are two planners currently available from Heart of the Farm, the 2017 Minty Stripe which is what I received and have pictured and the Buffalo Check design. Both are available for $59. Heart of the Farm also sells Mad for Plaid Thank You’s ($12), Note Cards ($12), Pencil Sets ($6), a variety of decorative items and Recipe Cards ($12). What planner are you using in 2017?